The bankruptcy trustee extends the period for filing bankruptcy claims from May 29, 2015 until 12 noon July 29, 2015. After July 29, the only things that a user will be able to do through the online method will be to view bankruptcy claims filed by the user and transfer the bankruptcy claims to another person. A notice (link) posted on Mt. Gox’s website, says customers can make bankruptcy claims by signing with their account at claims.mtgox.com. There is also an offline option. Those filing must sign up to, or already have, a Kraken account since any returned coins will be deposited via the service. Returns will be calculated at a rate of $483 per BTC with an additional 6 percent per annum. Mt. Gox customers have until May 29 to file their claim. The company’s creditors plan to make a decision on returns by September 9, 2015. The Company files for U.S. bankruptcy protection in Dallas late Sunday saying without protection it will spend substantial funds defending itself against Gregory Greene’s class action. 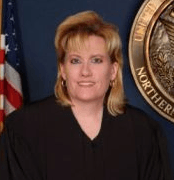 Greene is scheduled to ask a federal judge on March 11 to freeze Mt. 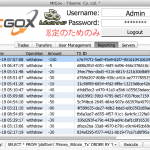 Gox’s U.S.-based servers and other computer equipment and to set up a trust over Mt. Gox’s U.S. assets. The Chapter 15 filing allows Mt. Gox to ask the U.S. Bankruptcy Court to recognize its foreign bankruptcy and to assist in the Japanese proceedings by protecting its U.S.-based assets. U.S. creditors can contest Mt. Gox’s request for Chapter 15 protection. The company opens a call center for customers inquiring about the status of their Bitcoins held with the exchange. A CoinDesk poll of nearly 3,000 readers (Started on Feb 4) finds that a majority of Mt. 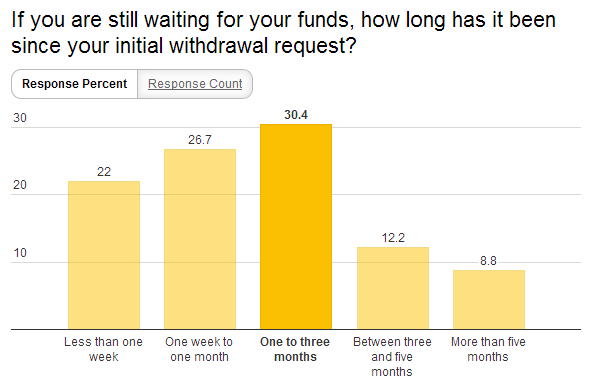 Gox customers have been waiting months for their withdrawal requests to be fulfilled, despite being ‘verified’ or ‘trusted’ account holders. Poll respondents describe frustration with the exchange’s customer service, calling it slow, opaque and providing “canned responses”. Mt. Gox and bitcoin business incubator, Coinlab had formed a business partnership last November, giving CoinLab the exclusive license to market Mt. Gox’s services in North America. But CoinLab had filed a complaint on May 2, claiming $75million damages, alleging that Mt. Gox had withheld information it needed to market to customers, instead continuing to sell into North America itself. In response, Mt. Gox alleges that CoinLab was not able to operate lawfully as its partner in the US, the reason for the $5.5m damages suit. Following the recent arrest of five people from Liberty Reserve in the US, Mt. Gox takes steps to avoid action from US authorities announcing it will no longer accept anonymous accounts. It continues to allow Bitcoin deposits and withdrawals but any currency transactions need ID checks. New staff have been hired to verify accounts within 48 hours. The US Department of Homeland Security (DHS) issues a warrant (document) to seize money from Mt. Gox’s US subsidiary’s account with payment processor Dwolla. The warrant suggests the US Immigration and Customs Enforcement (ICE), an investigative branch of the DHS, feels the subsidiary, which should have been licensed by the US Financial Crimes Enforcement Network (FinCEN), has been operating as an unregistered money transmitter in the United States. Despite repeated requests to do so, Mt. Gox has failed to deliver all passwords, Yubikeys, administrative logins and any other security information required so that CoinLab may assume operation of the Bitcoin exchange services for customers in the United States and Canada. The price of one bitcoin breaks through the milestone $100 barrier for the first time. Mt Gox is processing 76% of all bitcoin trades or $6 million worth of Bitcoin trades per day, which equates to $60,000 in daily revenue for the company which has 18 employees.